Defying the German military regime that occupied Holland for five long years might be likened to a game of chess. Essentially non-violent in nature, Dutch resistance during World War Two largely centered on gathering intelligence, occasional acts of sabotage, and harboring downed Allied airmen. Among the many resistors who participated was a commercial grower of flower bulbs, whose entire family of five engaged in numerous forays against the common enemy. What follows is a first-person narrative of those tense and terrible times. 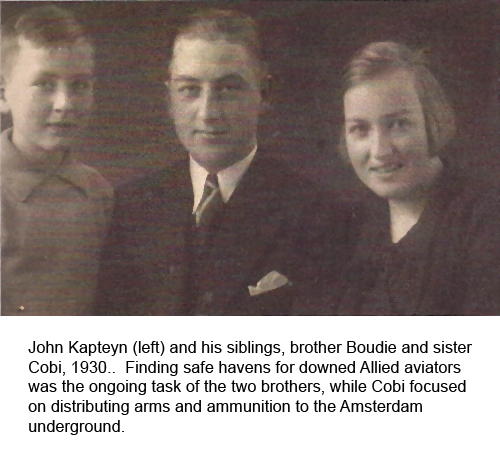 At age 23 and living at home with his parents, John Kapteyn and his brother Boudie helped establish a local branch of the Resistance in Sassenheim, a Dutch town of 6,500 inhabitants. Now approaching his 95th year, John consented to share his memories of those dark days that politically divided so many of his countrymen. For the Kapteyn family of five, the drama begins inside a crippled B-17 returning from a bombing mission over Germany. 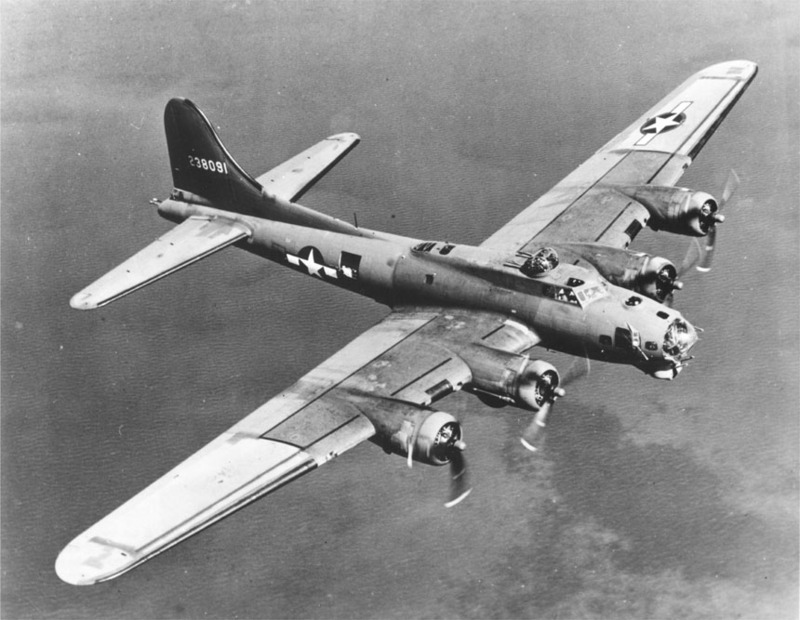 The flak-damaged Flying Fortress (ironically named ‘Straighten Up And Fly Right’) enters Dutch airspace with three of its four engines fading. The doomed aircraft continues its rapid descent south of Amsterdam. Among the nine-man crew is radio operator Albert Morrison Cobb. Cobb: “I helped throw out everything that was loose in the plane, and then started sending S.O.S messages to our home base in England in case we ditched in the North Sea. But we never made it over water. Our pilot, Bob Proudfit, brought us down and I can say his wheels-up crash-landing was near perfect – thanks in part to the flat open countryside. Two of the men aboard were wounded. 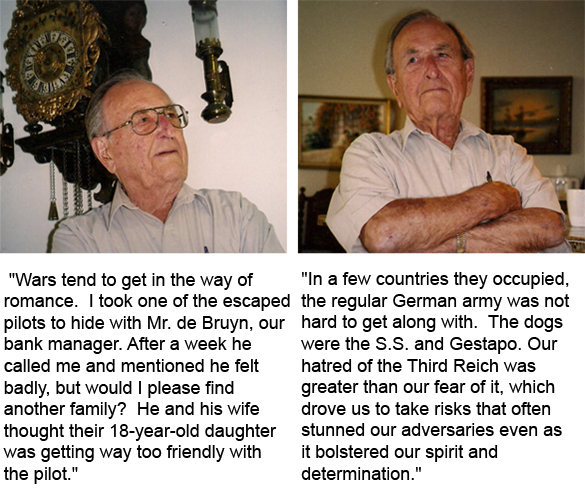 “We were soon confronted by a number of Dutch civilians who came running up out of nowhere. They took us to a lakeside building where we exchanged our flying clothes for blue workman’s coveralls, so we’d blend in. Some of us even got wooden shoes. They also fed us. Three days later we were split up and delivered to different Dutch households. Staff sergeant Cobb and most of his crew eventually made their way to the outskirts of Rotterdam. They then continued south, where in late March, 1945 they met up with advancing soldiers of the First Canadian Army. John Kapteyn: “Sergeant Cobb arrived in Sassenheim along with Lieutenant Walter, the co-pilot. Where Cobb was quiet and reserved, Walter was his alter ego. To put it plainly, he was belligerent, loud and stubborn. Like they say – it takes all kinds. “Lieutenant Walter was placed with the Boot family. The Boots lived on the south side of town, the Kapteyns on the north side. I gave strict instructions to Walter – as well as Cobb – not to contact each other. It was too dangerous. Once, I heard our front door bell ringing and there stood Walter. He said something like ‘Hi’ – as though everything was normal. Here was an American airman, prancing footloose and fancy-free in occupied Germany territory making house calls! He asked for Cobb and I told him: ‘Get the hell back to the Boot’s home –and don’t talk to anyone on the way!’ Considering the severe wartime conditions then prevailing, my parents and others like them took a monumental risk harboring Allied escapees. Just how risky makes me shudder, even now. Had we been discovered, Cobb and Walter would have been taken into custody and sent to a German POW camp. As for my parents, they would have been shot by a firing squad in front of their house. And the house itself set on fire as an example. But not before being tortured and half-beaten to death by either the Gestapo or the Sicherheitsdienst – the intelligence service of the SS — in an attempt to get them to reveal the names of fellow resistance members. Assignments within the “Interior Fighters,” as the resistors dubbed their clandestine organization, varied widely. 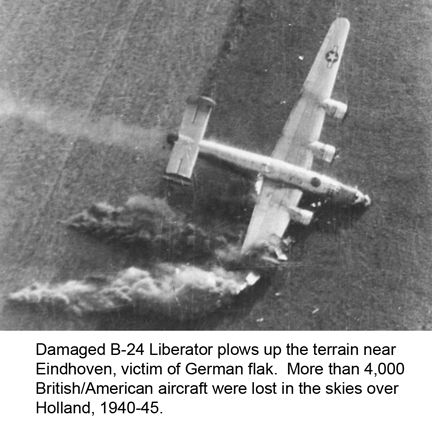 Finding shelter for downed aviators was of primary concern (an average of three aircraft a day – both German and Allied –came to grief over Dutch territory during five years of aerial combat). Spreading the word, both good and bad, was another priority. German propaganda — via newsprint, posters and radio — was countered in kind by the underground, ample proof that two could play at the espionage game. Telephone code words were an absolute necessity, to thwart possible eavesdropping by the wire-tapping Gestapo. Kapteyn: “In nearby Leiden, as in a number of other cities, there was an underground news bulletin printing shop. I had no idea where it was located – none of my business. When word reached me that a bundle was ready for pick up, I went to the Biesiot café where I took a seat and ordered a cup of ersatz coffee – real coffee being non-existent. My contact was with a certain waiter. Once he recognized me, he would casually point toward a wrapped bundle in a corner near the coat rack – the all-clear signal. On departing with the bundle, I then took the ‘Blauwe’ tram, an inter-urban streetcar, to Sassenheim. The tram usually consisted of two or three walk-through cars. I would lay the bundle on the overhead rack and then find a seat in the adjoining car — far enough away but still within sight of the bundle. If there should be a sudden luggage inspection by the Gestapo or the civil police, as sometimes happened, I had nothing in my possession to inspect. Once, I noticed two guys eying the bundle, which made me suspicious. So I left it behind. Once back in Sassenheim I delivered the bulletins to ten trusted people who in turn passed them on. “During the war there were four categories of Dutch citizens – underground resistance fighters, uncommitted neutrals, and those who openly or secretly collaborated with the Germans. Plus a handful of double agents who dared to play one side against the other. The unaligned neutrals were in the majority, and customarily avoided contact with either side. A country divided, thanks to our tormentors. Outbursts of defiant behavior soon became commonplace as stricter laws were imposed in regard to civil disobedience. One of many such incidents occurred when John was attending a martial arts class in Leiden. To a man, the students were intensely anti-Nazi, as evidenced by the following blow-up on a busy city street in broad daylight. “A man’s home is his castle.” This sentiment, dating back to Roman times, held no water in wartime Holland as the Kapteyn family would shortly discover. Kapteyn: “At 8am on May 9th, 1943 the Germans took over our house. Raus! – get out! Nine hours to vacate. On previous occasions we temporarily housed German soldiers, but nothing like this. Three Wehrmacht officers showed up with several local officials from the housing authority. The house was to be occupied by German army personnel, and converted for use as a recreation center and canteen. Now my parents had to find a new home. “The three-story house had a fairly large and attractive interior, and I think the Germans saw that as a total waste of space for just my parents and myself. We were given strict orders to leave everything in the house except personal belongings. “Father told me to go immediately and gather up the entire field crew. As a grower of flower bulbs sold in half-a-dozen countries, the firm of B.D. Kapteyn and Son had converted half its bulb acreage to growing sorely needed vegetables as well as two acres of leaf tobacco – a very valuable trading commodity. He also sent for nearby owners of handcarts who would lend us their carts for a day. Once assembled, the field workers were given the task of emptying drawers and removing all the furniture which they then carted off to the company warehouse. Finally, other neighbors came over with an assortment of sagging beds, worn rugs, rickety end tables, wobbly chairs and so forth, with which to refurnish the house. Kapteyn: “My mother, father and I had just finished lunch. Mom went upstairs to take a nap, while dad and I remained in the living room to have a discussion. Father suddenly stopped in mid-sentence and hissed: “Quick! – get out!” It was pure luck that our living room windows facing the street were fogged up that day. Dad could see anyone approaching our front door. But oddly enough — from outside — no one could see in. “I spun around to find two uniformed Germans and a local policeman coming up the sidewalk. While father slowly reacted to the buzzing doorbell, I quickly flew out the back door. As the Interior Forces increasingly spread its tentacles, John became associated with other resistance members. One in particular – Hans van Eck – took John into his confidence and they became close friends. Kapteyn: “We made it a point to connect every once in a while…stay in touch. Hans was into it right up to his neck. I knew of one railway bridge he dynamited – and the locomotive that derailed as a result. To add insult to injury, the explosives he used were stolen from a German-operated coal mine in southern Holland. Yes – believe it or not, we have coal in Holland, buried under many layers of peat. Hans was also a determined bank robber, complete with face mask. But not to fill his own pockets. He used the stolen money to buy black market food and other necessities for people in hiding. Like invading locusts, the Germans descended on Holland’s agricultural industry. Their primary target was the enormous stockpile of vital foodstuffs meant to supply the Dutch people under wartime conditions. By the end of 1942, what was left of the inventory had been shipped to Germany. From that point on, the majority of Netherlanders suffered a hand-to-mouth existence. Kapteyn: “The authorities issued a series of ration coupons, without which food and fuel could not be purchased in the open market. This led to increased black market activity, as well as break-ins and armed robberies at a number of coupon distribution centers throughout Holland. The last half-year of the German occupation was a living nightmare, especially in the densely populated western provinces. The official daily bread ration – made from flour containing 30 percent sawdust — gradually fell to 400 grams. Beginning the previous November and continuing to war’s end in May 1945, store shelves in the big cities were virtually empty. The Dutch government in exile ordered a six-week railway strike, and that clinched it. In retaliation, the Germans cut off all supplies of food, fuel, clothing and even medicine going to the west, including Amsterdam. An estimated four million people – half the Netherlands population — were barely kept alive by community soup kitchens. The main course consisted of cabbage leaves and potato peels. The result being, some 18,000 deaths were attributed to malnutrition by the time the war ended. It’s hard to imagine today – seems more like a fairy tale – but the entire tulip and crocus crops for 1944 entered the food chain in an attempt to fill in the gap. My father opened his bulb warehouse, and within two hours nearly 300 people lined up. Mother cooked tulips just once – so we’d know what it was like. They were boiled like potatoes and tasted terrible. Our family was fortunate, in that we could grow most of our own food. If it weren’t for the Allied air forces, many more would have died. The British and Americans air-dropped thousands of tons of food in numerous locations – which is another story in itself. “Before long, meat of any kind became a distant memory for city dwellers. Early on, our family began trading homegrown tobacco to other farmers in exchange for illegally slaughtered meat. Slaughtering of livestock was only allowed under German supervision. And of course most legal meat went to Germany or to German soldiers stationed in Holland. We traded tobacco not only for food, but also clothes and shoes – all without ration coupons. During the winter of 1944, Sergeant Cobb showed us how they cured ham ‘down in North Carolina.’ What a treat! But wait, says John – there’s more! Let it be known the indomitable Dutch dismantled their own dwellings in a determined effort to stay warm during the coldest winter in two decades. The enterprising Kapteyn family was no stranger to America, having visited bulb-buying customers in the U.S. during the 1930s. Beginning in January 1940 — to gain experience — John accompanied his older brother Boudie on sales trips throughout the Midwest and east coast. Returning post-war to America – and determined to start out from scratch on his own – John Kapteyn’s newly formed Holland Bulb Company gradually built up a steady clientele. In 1984, John retired in Portland, Oregon and sold the business to his son Bruce. 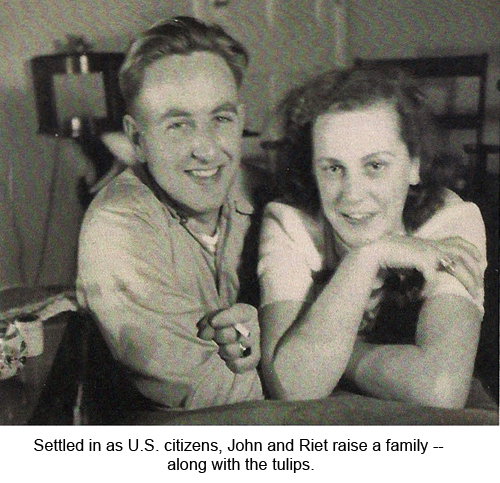 Thereafter, John and his wife Riet devoted much of their time to foreign travel, visiting thirty-three countries in all – plus a dozen return trips to Holland over the years. family dating back to 1538. I am very proud of my father, John Kapteyn, and my sister, Amy Welch, for compiling this amazing information. It will be read by generations to come. Great and warm story with a lot of interesting details that I love to share with the readers of the book I am working on now and that will be published next May. As a writer I am living also in the city of Sassenheim and am very interested in the recent past of the Holland bulbdistrict. On my website (www.lokaalboek.nl) you will find a selection of the books I have written untill now. For your knowledge, in the nineties I already have written a book about Sassenheim during WW2 but at that time I did not have this particulair inside information from the Kapteyn-family. I wondered if you can provide me by e-mail with pictures, related to Sassenheim and the WW2-period. Beside that I am also interested in pictures (and stories) related to the famous Holland-bulbindustry. As a Canadian that has lived in Canada for the past 60 years, I have never wanted for anything and therefore cannot imagine how bad it was for your family during the German occupation. I am proud to say that my father served in the Royal Canadian Dragoons as a Scout Car driver attached to the !st Canadian Division during the liberation of Holland in 1945. I also served in the Canadian Forces with the Royal Canadian Dragoons based out of Lahr West Germany in the early 70s and I had the distinct honor of visiting Amsterdam while on leave. During this trip to Amsterdam, I wore a summer jacket with a huge Red Maple Leaf design on the back of it and people could tell from 100 yards that I was Canadian. 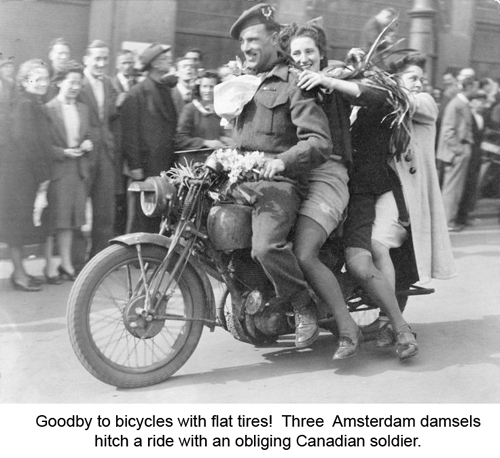 On many occasions I was stopped on the street and thanked for all the Canadians did during the war! I am production designer for a poignant ultra low budget independent film about an elderly Dutch woman’s attempts to reclaim a family painting traded for food during the 1944-45 Dutch Hongerwinter. The script calls for the actors to look at photographs of the Hongerwinter and, naturally, I can only use photographs that are in the public domain or for which I can secure free permission. 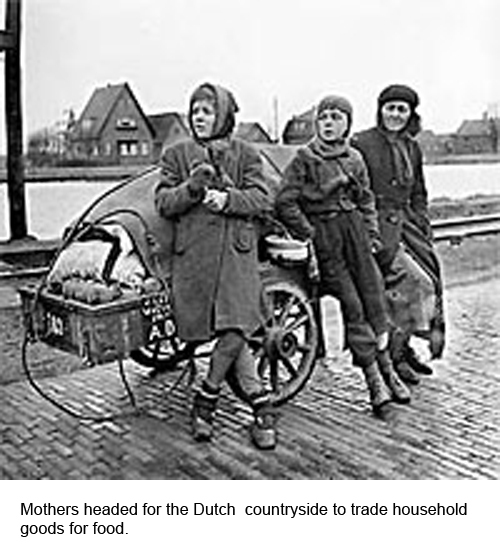 Could you please give me more information on the image ” Mothers headed for the Dutch countryside to trade household goods for food”? Any help you can provide would be greatly appreciated. As far as I am concerned, you certainly are welcome to use the photograph. But you probably will want to talk to Tony Welch about where he got it. I am unable to find my correspondence with him that led to this story appearing on my website. My best suggestion is to try to find members of Mr. Kapteyn’s family in Sassenheim. They should be able to put you in touch with Mr. Welch. I am sending you a copy of John Kapteyn’s helper file from WWII in case it might be of any help.